So…did you notice something different when you first looked at this page? If so, did you realize what the difference is? [If this is the first e-newsletter you have received from me, you will not know what I am talking about and that’s okay.] And, if your answer is: “That is a different book cover.” Then you are right. Speaking of— don’t you think Molly Keller did a fabulous job on the art? Just wait till you see all of the book interior —- it’s like a gallery! —AGAIN! Thank you, Molly! Behold, my new book, His Name is Jesus— and I am so excited! How many people know what happened to Jesus on the 8th day after He was born? Many will say: “He was dedicated.” And they would be wrong. Actually, He was dedicated on His 40th day after birth, which is the subject of my 3rd book, in the series. If you are Jewish you will probably get the right answer and say something like: “He experienced the rite called Bris Milah. At the young age of eight days, Jewish boys experience the custom called “Bris Milah”, at which time their names are officially recorded in the Hebrew records. In “His Name is Jesus”, you can travel with Joseph and Mary as they take Jesus to the home of a rabbi for His own ceremony. While walking along the dusty road, Mary & Joseph each recall the most unusual way in which they came to name their baby son. Their faithful donkey, Gil, which means “Joy” in Hebrew, is of course with them as well. In fact, Gil alerts them to an alarming danger as they visit in the Rabbi Jonathan’s courtyard. Meanwhile, back in Nazareth, the young donkey, Elpis, which means “Hope” in Greek, is still missing her mama, Gil, who is traveling on an amazing adventure with Joseph and Mary. But Elpis continues to be comforted in a very special way. So join in with these wonderful characters of the Bible and continue learning about the young life of Jesus. Young and old alike take pleasure in gaining insight into these very early days of the King of kings, so artfully captured in the story and illustrations in “His Name is Jesus”. As with Joy Comes to Bethlehem, His Name is Jesus is self-published, though I have used a different publishing house this time. With the help of Ken Henderson, of Henderson Publishing, I have made great effort to keep the price down so more folks can enjoy the book and be able to give more copies for gifts, etc.. Gratefully, this has been accomplished. We all want to help spread the Good News. Don’t we? And, because it is self-published, I am doing all the promoting and market myself, that is along with your wonderful word–of-mouth recommendations. I was totally WOWed by the help of so many of you with selling and promoting Joy Comes to Bethlehem. That means the world to me. I hope you are as enthusiastic again this go round. Believe me, I cannot thank you enough! So …. “What is the price?” you ask. I am happy to tell you it is $10.50 per book. That is several dollars less than my first book, which retails for $16.99. I’m sure you and others will be happy about this too. Matter of fact, if you have not yet purchased a copy of Joy Comes to Bethlehem, (or maybe you have but want another copy), and want to get one now, along with His Name is Jesus, you may purchase “Joy Comes to Bethlehem” at this time (from me) for only $12.50. Shipping for 1 to 3 books is $3.00. (Add .50 more for each additional book to be shipped). For those of you who are local, I will be happy for you to pick them up from me or at my husband’s office (Hill Insurance), if that is more convenient. And don’t forget to tell me if you want your book/s personalized for yourself or someone else. Thanks so much for taking your time to read this. I know it has been a bit lengthy, but I have a lot to say! Please see my contact information below. And … Come to the official Book Launch ~ Fun ~ Food ~Books! God bless you and yours as you embark into Summer 2013. I hope it treats you real nice! You might even find yourself writing a book! I have a new web site under construction and hope to get a lot of work done on it within the next week or so. It is www.conniewohlford.com —- Check it out — but be patient as I get it updated (with the help of Jeff). 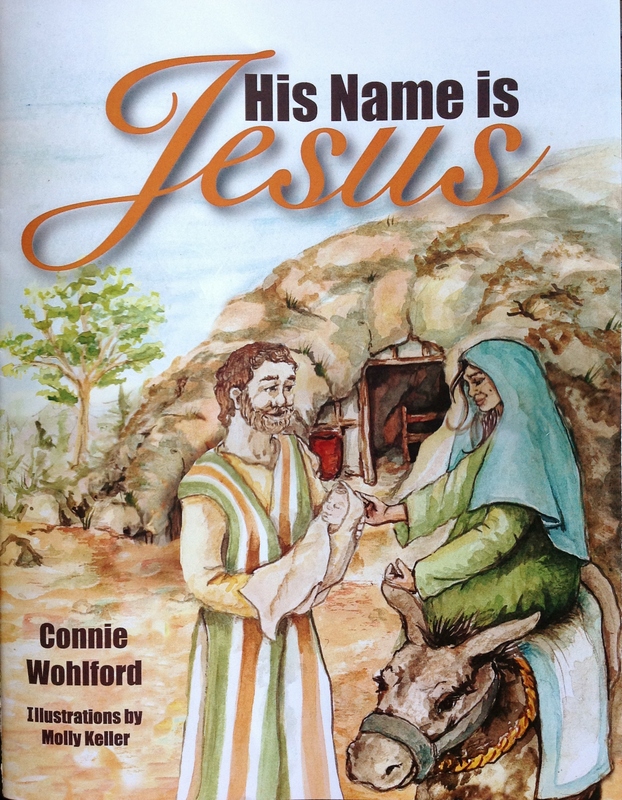 And, HEY, if you have not yet clicked “Like” on “Connie Wohlford, Author” on Facebook, please do so. Thanks a bunch! Feel free to forward this to anyone who you think might be interested. Thanks! Generally in this next space in my e-newsletter, I have a continuation of the telling of my story of how I came to start writing my books. But since this is already so long I will forgo that until the next installment of Joy Comes Newsletter. Also, I have been enjoying telling my story for a few civic and church groups. It seems that many folks are interested in getting into writing from the heart and like to hear about my own experience.